We are located on E. Saginaw Hwy. between Nixon Rd. and S. Clinton St. The manager of this store is Alex Thayer. Alex has been with CARite since 2017 and has owned and operated CARite of Grand Ledge since February 2018. Alex employs an experienced, knowledgeable and friendly staff to help him run the location. Alex has grown up within his family’s dealerships. It's all about creating a dealership environment that feels like your neighborhood family dealership. Step into meet Alex and his team, and find out why CARite of Grand Ledge enjoys so many repeat customers and referral business! You won't be disappointed! I came in feel down and thinking I'd be turned down. But Shelby Kinsey help me with help words, confident body language and a beautiful smile. She helped in every way possible even brought up different options for me to choose from. I highly recommend them. They worked with me and my credit was and is not the best. Shelby and Alex are awesome to work with on buying a vehicle. No pressure on selecting which car or truck your looking for. They go out of their way to help get financing to fit your budget. What an amazing experience! I started my car search not too long ago, knew what I wanted but didn't have time to get away from work to come in and do all the paperwork. Nick and Shelby were wonderful. Shelby made a what should be a long and tedious journey of getting a car to something that took little time. Thank you! Would definitely reccomend. Would highly recommend for service!! An oil change place told my daughter she needed a bunch of things done to her car. We took it to CARite, they spent alot of time looking it over, told us there wasn't anything urgent that needed to be done. They also explained when they thought certain things may be needed in the future. They did not charge us anything for doing this. They were very helpful and we would definitely go back. I recently bought a car from here and was very pleased with the customer service I received. Tyler and John were both very friendly and helpful and found me a great car that had everything I wanted. I definitely recommend Carite for anybody looking to buy a car. Great customer service, very helpful and was able to find everything I was looking for in a car that was within my budget. 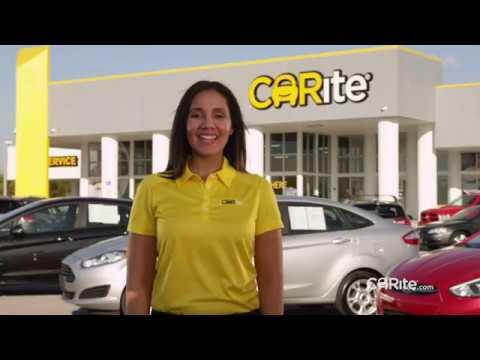 Recommending Carite to anybody I know who is in the market for a car. Not so happy with these folks, gave me a low ball trade for my truck. Sure it has a lot of miles but it shouldn't be totally based on that. Shelby was great. She didn&#8217;t try to hustle me, and got me what I wanted within my price range. Everybody treated me and my family with respect. The service was great, got an awesome car for a decent price. Was beginning my search for a car with little to no knowledge at all. Shelby really worked with me the whole journey, putting my needs first! And with the warentee they offer, this is definitely the place to go for your car needs! By far satisfied this far!